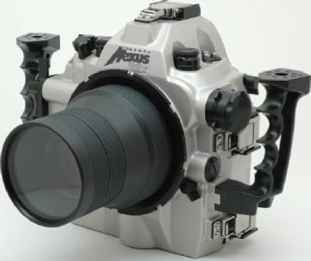 The Nexus Nikon D2x housing is cast aluminium with 26 function controls. The notched adaptor ring allows Nexus F90 ports to be fitted. Without the ring, Nexus F4 ports can be fitted. 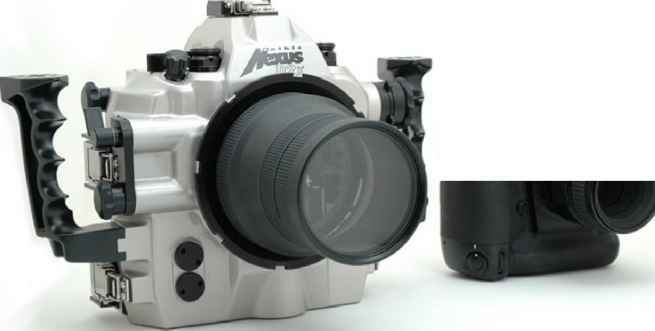 Nexus is a well established Japanese housing manufacturer and their latest Nikon D2x housing continues their cast aluminium approach whilst nearly all the other manufacturers are moving to solid block machining. 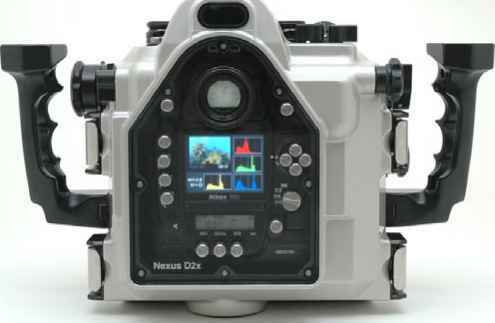 Similarly the Nexus D2x housing follows their traditional mechanical design in a form-fitting hull. The casting is really fine and intricate and Nexus must have burnt some midnight oil to get a cast housing to market so quickly. The front and rear housing sections are secured by five overcentre catches and are best opened with the housing in the upright position rather than face down. I've never been a fan of Nexus overcentre catches as they are very close to the handles and prone to trapping your fingers but I guess I could get used to them in time. 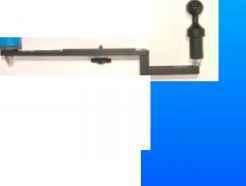 Installing the camera is a breeze and very positive but the camera's eyepiece cover must be removed and replaced with an element which forms part of the viewfinder optics. The camera is mounted onto a saddle with a tripod socket screw and the only alignment needed is the MSC switch on the left. That said it is possible to load the camera with the shutter release lever pressed down which could be a pain if you don't check it and then get into the water in a hurry! It would be possible to fit a small return spring which would solve this possibility. There are push button or rotary controls for 26 camera functions and whilst most can be seen on the camera through the large rear Perspex port the ones through the aluminium hull could really do with stickers to say what they are for to avoid any confusion when things are happening fast. The large Perspex port top right gives a good view of the camera's LCD screen. The large rear perspex viewing port is good for viewing the camera's controls but I wonder whether in bright sunlight the LCD screen could do with some sort of shade. 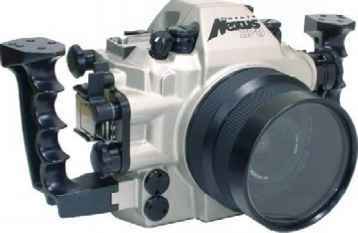 The Nexus D2x comes in two versions to accommodate Nexus's Nikon F4 ports or F90 ones which are a different thread size. The housing I reviewed was for the F4 ports but an adaptor was provided to take F90 ports. To my liking the handles are too close to the housing especially when wearing gloves but I understand extenders are available to create a more comfortable spacing. All of the controls line up nicely except the dynamic focusing lever. 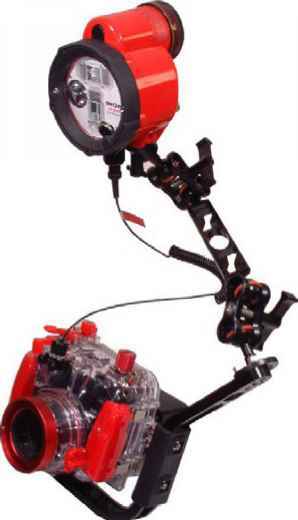 This a friction/turn control which would be better as a claw lever design. I don't use a Nikon D2x but I am reliably informed by UwP major contributor Alex Mustard that this is a function he uses a lot. With such an expensive camera installed I would have liked to have seen a leak detector fitted but the large rear Perspex screen should let you see any water ingress. The camera mounts onto a saddle with a tripod socket screw and is very positively positioned. The housing form follows the camera closely. sync sockets. The right hand socket is placed so that there is no room for a metering mode switch control so if you like to switch from matrix to spot metering on a regular basis you will be disappointed. In terms of price (which varies from country to country) the Nexus is dearer than an Aquatica but cheaper than a Subal. For those who already use a Nexus housing it makes sense to stick with them and use your existing ports. You will already be used to working with the Nexus design. For those D2x users buying a housing for the first time I would take time to look at other housings because this is an important investment and what may suit me may not necessarily be your cup of tea. One thing's for sure the demand for D2x housings is outstripping supply so you may need to wait to get your delivery. Nexus. Made For The Professional. PricedFor The Enthusiast. Nexus housin gs for Nikon's D70 and D2 series cameras are your entry into one olí the world's most exten sive unde rwater imagi ng syste ms . It's a system that brings together superbly engineered aluminium housings cine' a port range that lets yo u sh oot fish eye to super te le macro. All at exceptio nal ly ke en prices. See the Nexus system at our" new showroom o n London's Strand. Everything will impress you induding the price. 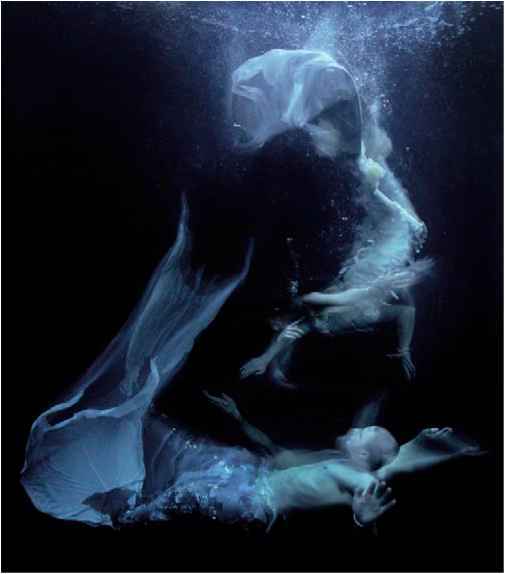 Believe it or not, Zena Holloway is only in her early 30's and yet in a short space of time she has established herself as the most creative advertising photographer underwater based in the UK. She works for international clients keen to have her unique images representing their companies and products. Originally intending to study architecture after school she went on a diving holiday in Egypt and, you've guessed it, she got 'the bug'. She became a dive instructor there followed by a stint in the Caribbean during which time she used her Sea & Sea MX10 with mixed results but she knew she wanted to make her way in the underwater film world. Returning to the UK three years later she wasn't sure whether to go the wildlife route which is the norm for many photographers. She sought advice from as many experienced people as possible but in the end it was more circumstance which helped mould her direction. London. The experience proved invaluable and she came into contact with a new world a far cry away from those early days in Egypt. It was exactly the environment in which Zena could immerse herself and learn from all those around her. Extreme Facilities were used by many of the crew who were working with Mike Portelly. For those who don't know Mike, he, more than anyone else in the UK, put underwater based commercials on the map. His pioneering imagery which began in the early Eighties has been used extensively ever since. Zena, however, did not work directly with Mike but she got work with some of his crew and she must have done a good job because they kept re-hiring her when ever they were shooting! At about the same time she started to shoot her own images, mainly in swimming pools, but with advertising firmly in her sights. This was very much a hand to mouth time and she was helped by many people in the industry who gave their enthusiasm and time for free. This was a major shoot earlier this year in Grand Turk with a team of twelve in Zena's group together with six clients from the commissioning agency and the client so no pressure there then! The big problem was the weather which was awfidfor most of the trip producing water 4°C colder than normal (important if all you are wearing is a latex mermaid suit! ), strong currents and poor viz. Zena had four models- 2 female, 1 male and a child - and the amazing suits were made by Thomas Shouse aka "The Tail Man " in the movie world. The suits were a tight fit, beautifully hand coloured but had no relief zip (if you get my drift). To give you an idea of scale, the tail was about 1 metre (3ft) across. Zena used an Aquatica Mamiya RZ67 housing modified to take a Phase 1 digital back which gave her unlimited exposures and the ability to view the results straight away back on the surface. It was shot with available light with a little bit of digital enhancement. This was a shot taken in 2003 for Poly dor Records as an album cover for the band Love Field but Zena is not sure if it was ever used as the band were having some problems. Taken in a private swimming pool in Weybridge with a white drape background, the model was a Canadian girl who Zena screen tested underwater and knew immediately she was ideal for the job. The shot was lit with soft lights 'all over the place' and captured with an Aquatica Nikon F5 and Provia 400 film. 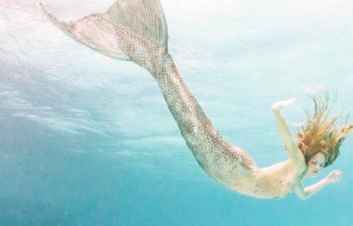 Taken in 2001 this was Zena's early personal shoot of the mermaid's tail idea. The tank was draped in black and long shutter speeds created a dream-like effect. She worked with four free divers over a period of three days in the Oceanic tank in Devon and made the costumes herself from pale and silver neoprene. Once again she used an Aquatica Nikon F5 housing with Provia 400 with single top lighting. This was a billboard advert for Greenpeace commissioned by Saatchi in 2004. 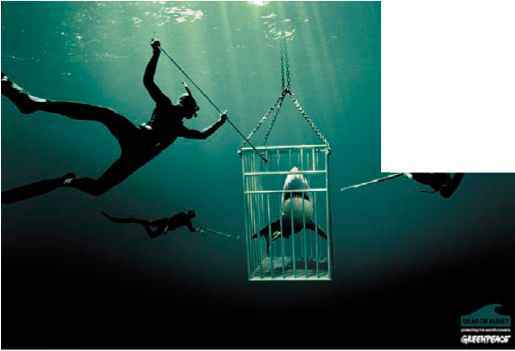 It was shot in Cyprus in one long day with the specially made cage and three freedivers. The shark was a bought in shot and added digitally. Zena used an Aquatica Nikon F5 housing and the shot is taken with available light with Provia 400 film. 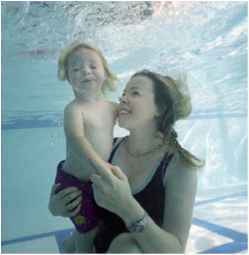 Zena has a three year old daughter, Brooke, who quite naturally is already a star underwater and they live with her partner Patrick in West London. the men's perfume giant. From there her confidence and scale of operation grew exponentially. End that things really started to take off. She has since worked with Steffi Graf, Travis. Placebo and pop promo king Chris Cunningham to name drop but a few and despite thinking she would always be a stills photographer is now in demand directing commercials. She operates very much in the agency world where multinational clients will only work through accredited agents and advertising agencies but, if it all sounds ideal, there is a great deal of frustration as favoured projects can take months to materialise and almost two in three jobs quoted for never go ahead. Despite all this Zena is positive about the future and her main ambition is to direct a car commercial underwater! In photographic terms Zena is the first to admit that she knows only what she needs to. She uses photographic equipment to capture the images she wants rather than get bogged down with all the photographic intricacies. She is however a true devotee of the digital age and has always been very computer literate. She now uses almost exclusively a Canon MK2 IDS in a Seacam housing. UwP first featured Zena in UwP12 in April 2003 and I'm sure we'll be featuring her special images in future issues of UwP. 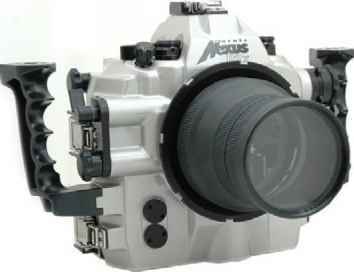 Digital underwater cameras have been a real breakthrough for divers. Offering instant feedback to speed up your learning curve, user friendly features like auto exposure and autofocus, zoom lenses with macro built right in and negligible shooting costs, digital seems the perfect solution for underwater imaging. Until you add a flashgun. Then the nightmares and confusion begin. Especially when it comes to getting the exposure right. With many guns you have to shoot manually. Often this means taking several test shots to get it right. Something you may not be able to do with a moving subject. Auto guns can help, but you need a camera with a fixable equivalent film speed and lockable aperture to use these properly. Inon's D2000 puts those problems firmly in the past. It uses the best flash exposure system in the world to get your lighting exactly right. Your camera's own flash meter. Accurate, dependable and affordable, the Inon D2000 marks the end of an era. The end of poor flash photography. Welcome to Inon. Simplicity through sophistication. Can you see the magic? 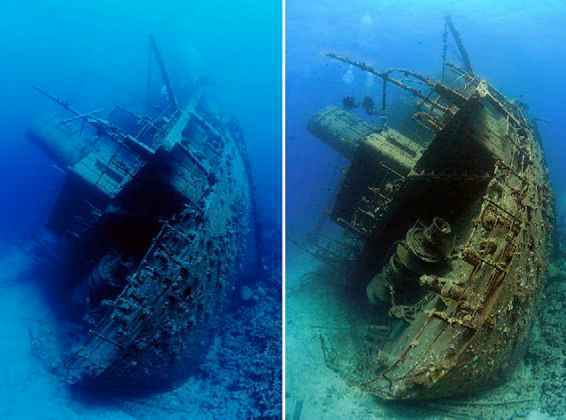 These two images of the Giannis D wreck were taken at about 15m in the Red Sea. Both are taken only with available light. The image on the left was taken on slide film in 2001 and the image on the right with digital camera and a Magic Filter in 2005, both by Alex Mustard. Left: Nikon F100 + 16mm lens, Provia 100. Right: Nikon D2x + 10.5mm + Magic Filter. Just over a week ago, Peter Rowlands and I sold our first Magic filter! 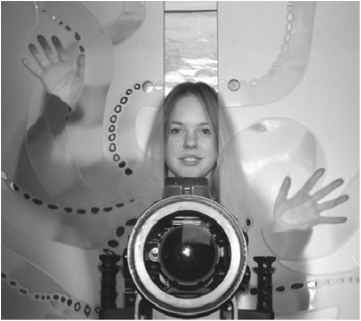 Magic is a new type of filter we have developed for producing digital colour images using only ambient light underwater! In this article I want to share with you my experience of how a private project turned, as a result of beer-fuelled banter, into a product we could potentially sell to a digital SLR photographer anywhere in the world! I don't want this article to read like a press release or a sales pitch, instead I hope it provides some insight into the process of what goes into producing a new piece of kit. Visit the website if you want to read the sales pitch at www.magic-filters.com although you still won't find the hard sell. We are just enthusiasts trying to help out others like us, who are addicted to taking images underwater. 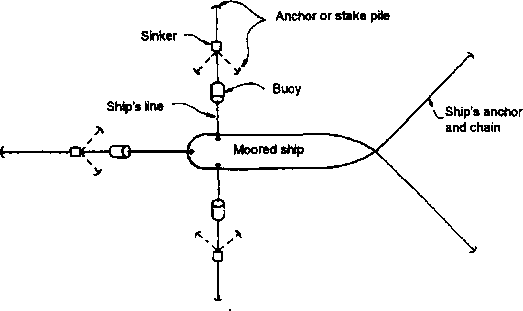 To start at the beginning, my interest in filters really began in the Red Sea in 1998. Peter Scoones had chartered the liveaboard Coral Queen to film for the BBC series Blue Planet, and a group of underwater photographers were invited along to fill the other cabins. During that trip I was bowled over by the amazing colours of the moving images that Scoones was capturing with just available light, a filter and his Digital Betacam. Peter Rowlands was also on that charter and was kind enough to share his knowledge of shooting underwater stills with filters (his 1983 book, The Underwater Photographer's Handbook, remains a classic reference on the subject). And since that trip I have been a filter addict! That said, I found that filters rarely produced pleasing images on slide film. It was just too difficult to get the right colours. Just being a foot (30cm) too deep or shallow would make the difference between producing a satisfying image and a duffer! What I needed was a still camera like Scoones' digital video, which would enable me to fine-tune the colour balance of my shots. That camera became a reality for me in 2002 when I got a Nikon D100 and Subal housing, which being a digital camera had the adjustable white balance I had desired for so long. I was so keen to test this new capability that my first pool shots with the D100 were white balance tests rather than experiments with any other feature of the camera (those images actually appeared in UWP 11 in February 2003)!